Substantial alterations had to be made to the building to make it safe. When it was finished the shell factory occupied 30,000 square feet and it was filled with second hand machinery sourced from many countries, particularly the United States. Sergeant Herbert Fairlie was appointed Superintendent of the factory. Like Dowie, he was an engineer who was seconded from the London Scottish Regiment for the duration of the war. Captain Downie, who was in charge of it, worked miracles with obsolete machinery; very good 4.5in shells were made on lathes dating from 1847. The great majority of the workers were girls. 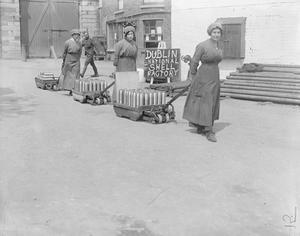 The wage for women workers was 15 shillings a week when many employers in Dublin were paying only 6 shillings a week. In the factory in Dublin there was a canteen which served wholesome food which many of the working girls were not accustomed to. The ladies’ committee presiding over the canteen was chaired by the Marchioness of Waterford. … on each evening the hall was thronged with men and women war workers, whose bright faces and merry laughter showed that for them life is worth living. To anybody familiar with the usual conditions of factory employment in Dublin the sight was most pleasing. It demonstrated in convincing manner that labour is not inconsistent with participation in the pleasures of life. The voluntary ladies committee was replaced in early 1917 by full-time catering workers because the operation of the factory had speeded up so much that the canteen had to be run on a 24/7 basis. 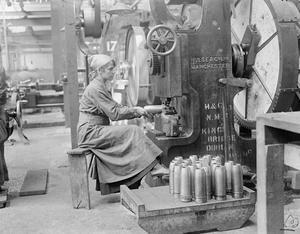 Women recruited to the munitions factories were unionised by the British-based National Federation of Women Workers. They had members in Dublin, Cork, Galway, Derry, Waterford and Wexford. This union and its members forced Irish employers to honour the government regulation of a minimum wage which had risen to £1 per week for women in government-controlled employment. This was despite the fact that under the Munitions of War Act 1915 lockouts, strikes and stoppages were banned. One of the NFWW’s most significant successes was securing the setting up of the Special Arbitration Tribunal for Women Employed on Munitions Works, held at the Shelbourne Hotel, Dublin, in April 1918, which raised rates and war bonuses not only for shell workers but also for canteen, cloakroom and cleaning staff. In September 1918 a strike by 29 men employed in the National Shell Factory in Dublin resulted in the lockout of 595 women. 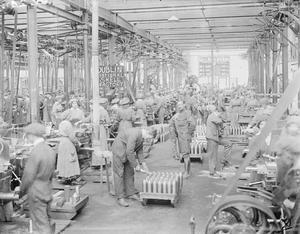 The dispute was resolved but in October 1918 the works manager was instructed to sack a number of the women employed in the factory, because it was possible ‘to reduce the staff somewhat, without affecting the output’. On 20 November 300 women workers were dismissed and by December 1918 the machinery was being dismantled with a view to closing the factory and the majority of the women returned to more traditional and significantly lower paid trades. The NFWW tried to negotiate compensation for them but without success.